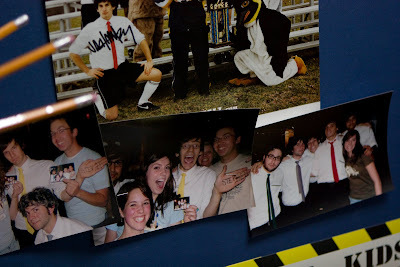 Coz asked if i’d re-post my tally hall entries from my blog onto HITS! i’m excited to share the good times with awesome-minded fellow tally hall fans. here it goes…. so. as most know, tally hall is one of my favorite bands. 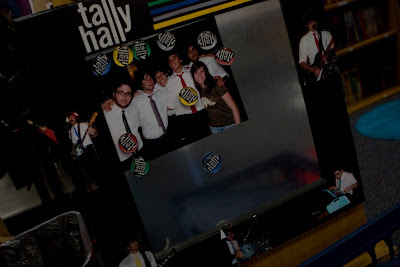 to understand more about tally hall and our history, check out my last review of their concerts. it’s long…i know…but highly entertaining. promise. this one will be long (and entertaining) too. i’ll do my best and add all the detail i can, because i know some of you wanted to go and weren’t able to make it, and some were really meant to be there (jeff & cheryl) but due to circumstances beyond their control, couldn’t. this one’s for you. i’ll even split it up into separate posts to break up the monotony of one gargantuan post. in reality, i wrote these december 21, 2009. yup, it’s taken this long to get the pictures uploaded. like jeff, i’ll sum these next 5 posts up for those of you who just won’t read them. had lunch with tally hall, went to two tally hall concerts in the same day, one was for a bunch of elementary school kids, awesome pictures after the second. true story. you might not go to all these links, but reading this would help understand how awesome it is that tally hall (on tour with rooney right now) performed twice in utah on friday, december 4th, 2009. that’s right…twice. and the first performance was at an elementary school. no, really. an. elementary. school. and cheryl invited me to have lunch with the band before the performance. i cannot explain how excited i was. not even because they’re getting “famous” or whatever (that’s cool too) but because i’ve met them three times (again, the homework is in that first link!) i was just excited to hang out with them because they’re just such cool guys. honestly. that’s one of the reasons they’re my favorite band. they are so super chill and fun that i figure i’d probably hang out with them if we ended up in the same town or at the same university. i got off work early and raced straight to the elementary school. upon asking directions of where i should go in the front office, i was asked if i was “with the band” by the secretary. she didn’t quite understand who i was or why i was there (apparently she didn’t read my blog post either) i looked around. “um…yes.” then i grinned, half guilty, to myself. “well, i’m friends with cheryl and with the band.” she told me i could just go on back then. i went past the cafeteria, where i saw a glimpse of the band warming up [pretty sure it made me randomly skip for a few steps] then i headed to cheryl’s classroom. i felt like a celebrity upon entering, because all the kids recognized me as i’m in most the band photos that cheryl has up on her wall. rad. the kids were all taking math tests, and listening to tally hall. i couldn’t have found a happier classroom test environment. fun at football games: we explained that at byu it’s always fun doing the wave because the section with the older folks in it is always fun to watch with the few who stand slowly and proudly with their hands in the air at the right time. apparently at university of michigan (where the boys met), they had awesome crowds and when the games got boring, they had the wave all figured out. they would do a few normal rounds, then one sped-up round, then one slowed-down round, then they’d reverse it, then they’d do the wave simultaneously in both directions. sheer brilliance. animation: i explained my major to them and apparently they got to tour pixar animation studios! i am so jealous. they said everything was very aesthetically pleasing and they let their workers kind of work on whatever they needed to, to enhance the creativity. so. awesome. no wonder it’s the goal of any aspiring animation student to end up there….i also recommended to them the book how to be like walt. yesss. i asked what their favorite tour was, and of course they first responded guster (where we first saw and met them)– but then they said that really, though, when they toured with guster they were surprised at the response they got in salt lake. rob said he thought maybe it’s because they look like missionaries. i think he might be right. 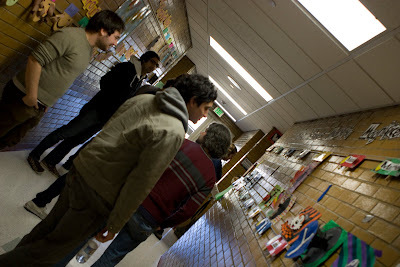 stay tuned to hear about cheryl’s classroom….